“We’ve made tremendous progress in our first year and are ahead of our initial growth plan,” stated Sean Spector, CEO and co-founder of Dropoff. “This is great evidence that Dropoff’s service is exceeding the demands of the business market." Dropoff, (http://www.dropoff.com), the fast-growing company dedicated to reinventing on-demand, same-day delivery logistics for businesses, celebrates its official one-year anniversary this month. Within the past year, Dropoff has grown from its headquarters in Austin to now cover the other three largest cities in Texas – Dallas, Houston and San Antonio. Dropoff has local and multi-city clients from a wide-range of industries, and has delivered everything from game programs to gift baskets, medications to machine parts and cupcakes to chrysanthemums. Among Dropoff’s most notable customers are American Medical Direct, a leading provider of intravenous medications, national cupcake chain Sprinkles, Oxford Commercial, part of real estate giant Cushman & Wakefield, and Central Market, a division of independent food retailer HEB. 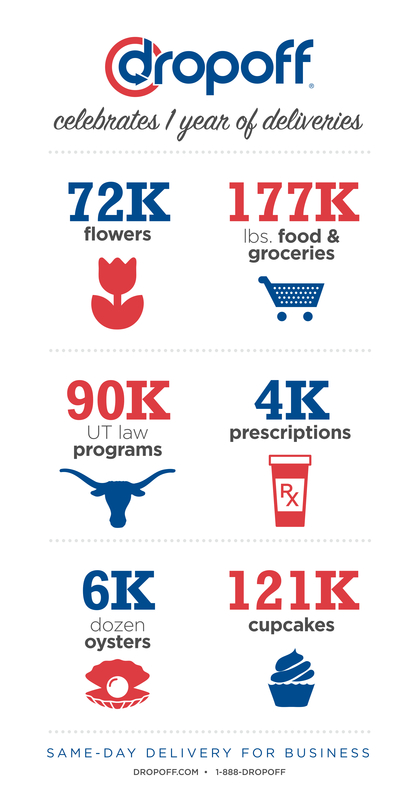 + Nearly 72,000 flowers, enough to give one to every Registered Nurse in each of the cities Dropoff serves. + 177,000 pounds of food and groceries, enough to feed everyone at a Dallas Cowboys game twice. + 90,000 law brochures, enough to deliver one to every undergraduate student at The University of Texas at Austin, Texas A&M and The University of Houston. + 4,000 home infusions, saving more than $8M in hospital outpatient service costs. + 6,000 dozen oysters, one for every expected attendee at the upcoming San Antonio Fiesta Oyster Bake’s 100th Anniversary Celebration. + 121,000 cupcakes, enough to give a dozen to every school teacher in Dallas. built on convenience, reliability and unmatched service, all powered by a proprietary technology platform. Dropoff provides easy web and mobile ordering, flexible delivery options, transparent pricing, real-time tracking and confirmations, up-to-the-minute ETAs, delivery Agent ratings and a feature-rich API for seamless logistics platform integration. Dropoff helps businesses with their complex same-day delivery logistics needs, so they can better, and more efficiently, serve their own customers. For additional information and a list of cities Dropoff serves, visit http://www.dropoff.com or call 1-888-DROPOFF. Dropoff is a Greycroft Partners backed company.